"This is a great place for a quick stop to get a feel for this craft in Bali. While the "tour" is not much, the ladies demonstrating in front are very skilled and congenial. Bring something for them to apply a design on - for just a tip. And don't hesitate to go inside, even if you just want to look; there are amazing items to enjoy. But! My husband bought one of their shirts - it was very inexpensive, lovely workmanship, and looked perfect right out of the dryer after being washed. Wish we'd found more! " Tohpati Village on Bali is at the center of the artistic batik art and is approximately 12 kilometers from Sanur. Batik is a traditional form of painting on fabric. They use dots and lines of wax in order to create a pattern. It is very impressive to see. 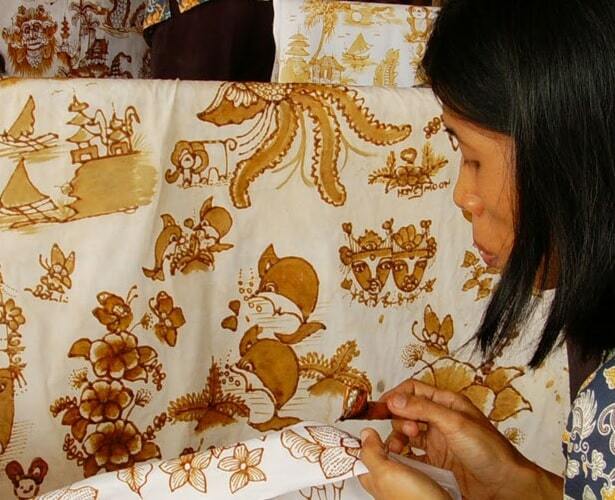 Often it is impossible to see how they make batik, but Tohpati the center to see it anyway. Batik Wall Weaving Center is worth a visit to see everything. Batik is very special art, which requires a lot of patience and skill. It is a traditional fabric printing. The word "Batik" means "drawing with wax." The technique must be thousands of years old. It is proved that this art already appeared in the first centuries in Africa, the Middle East and Asia. One suspects that it originated in India. Batik is quite different from the batik in Malaysia or the batik from Thailand. It is different in design, motif and the way in which one produces batik. In this technique, " paraffin wax" is used to cover components of the substance before this substance is dipped in a dye bath. So keep the part "was" covered with is the original colour. 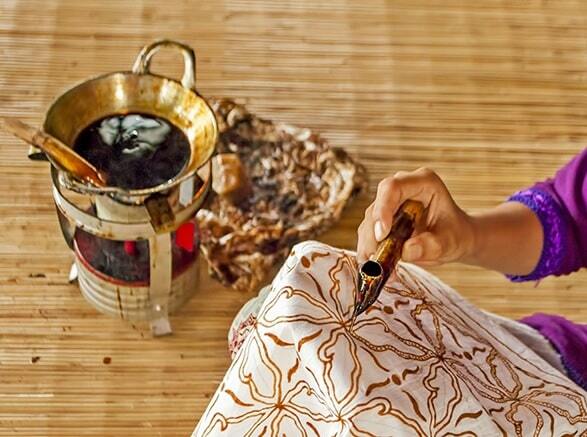 Batik making is a process with wax (candle wax), then dyeing, drying, and then cooking the material substances. Everything is done by hand. It requires a skill and over again reviewing what you've created. Therefore no work resembles the other! Who's going home without a Batik shirt? There are two main types of batik in Indonesia today; hand-painted and block printed. These types differ in production techniques, motif and aesthetic expression, and are often classified according to the tool that has been used. The painter uses the canting, a small copper container with one or more differently sized pipes. 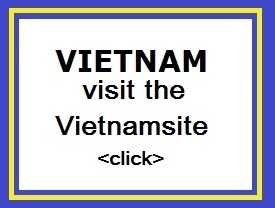 The container is attached to a handle made of wood or bamboo. 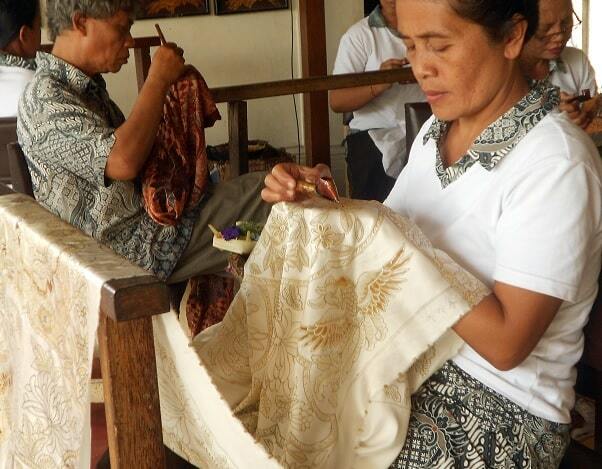 The canting is filled with molten wax and used to trace the outlines of the pattern on the fabric. The wax is usually composed of bee's wax, paraffin wax, resin, fat and a synthetic wax mixed together in varying proportions. The mixing builds on individual experience and skill. Each component has special qualities that affect the appearance of the finished textile. Bee's wax melts at a low temperature, is flexible, attaches easily to the textile surface, and is easily removed. Only the parts with "wax" remain unpainted of course . This process can be repeated with different colors. (I have a very artfully carved wooden) batik block stamp in my possession, but these are not so common). Batik souvenirs are very popular. Who doesn't want a tie and a shirt long-sleeved made from batik? The Batik Wall Weaving Center Tohpati is worth a visit to see how they make batik. Incidentally, you can buy batik on the entire island. However, a visit to a factory in Tohpati is the best thing to do. Perhaps there is Batik souvenir shops in the village of your hotel, where one can find the real batik. "The ladies out front that paint the pictures with the wax are amazing. I had a lovely picture drawn on my bag for the cost of a tip. Didn't like the guys who hover around and get you to go inside the big shop to buy the more expensive items, much prefer to browse myself."